Upton Sinclair "I never met a Socialist, or a Socialist cause, that I didn't like." 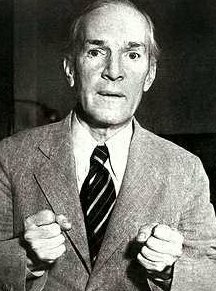 Upton Beall Sinclair Jr. (September 20, 1878 – November 25, 1968), one of the best investigative journalists of his era, was a prolific American author who wrote over 90 books in many genres, often advocating socialist views, achieving considerable popularity in the first half of the twentieth century. He gained particular fame for his novel, The Jungle (1906), which dealt with conditions in the U.S. meat packing industry and caused a public uproar that partly contributed to the passage of the Pure Food and Drug Act in 1906. However, he believed that the main point of The Jungle was lost on the public, overshadowed by his descriptions of unsanitary conditions in the packing plants. The public health concerns dealt with in The Jungle were actually far less significant than the human tragedy lived by his main character and other workers in the plants. His main goal for the book was to demonstrate the inhumane conditions of the wage earner under capitalism, not to inspire public health reforms in how the packing was done. Indeed, Sinclair lamented the effect of his book and the public uproar that resulted: "I aimed at the public's heart, and by accident I hit it in the stomach." Still, the fame and fortune he gained from publishing The Jungle enabled him to write books on almost every issue of social injustice in the twentieth century. Upton Sinclair was born on September 20th, 1878, in Baltimore, Maryland, and later moved to New York City. He lived much of his life in Pasadena, California, then in Buckeye, Arizona. Near the end of his life he moved to Bound Brook, New Jersey. Sinclair established a socialist commune called Helicon Hall Colony in 1906, with proceeds from his novel The Jungle. One of those who joined was the novelist and playwright Sinclair Lewis, who worked there as a janitor. The colony burned down in 1907, apparently from arson. Sinclair faced what he would later call "the most difficult ethical problem of my life," when he was told in confidence by Sacco and Vanzetti's former attorney Fred Moore that they were guilty and how their alibis were supposedly arranged. However, in the letter revealing that discussion with Moore, Sinclair also wrote, "I had heard that he [Moore] was using drugs. I knew that he had parted from the defense committee after the bitterest of quarrels … Moore admitted to me that the men themselves had never admitted their guilt to him." Although this episode has been used by some to claim that Sacco and Vanzetti were guilty and that Sinclair knew that when he wrote his novel Boston, this account has been disputed by Sinclair biographer Greg Mitchell. Sinclair was married three times. He took an interest in psychic phenomena and experimented with telepathy, writing a book titled Mental Radio, published in 1930. His papers, photographs, and first editions of most of his books are found at the Lilly Library, Indiana University, Bloomington, Indiana. Sinclair made several bids for national office. In 1906, the Socialist Party sponsored his candidacy for Congress in New Jersey. He lost with just over 3 percent of the votes. After moving to California in 1915, Sinclair went on to run unsuccessfully for Congress twice on the Socialist ticket: In 1920 for the House of Representatives, and in 1922 for the Senate. In 1934, Sinclair made his most successful run for office, this time as a Democrat. Sinclair's platform for the California gubernatorial race of 1934, known as EPIC (End Poverty in California), galvanized the support of the Democratic Party, and Sinclair gained its nomination. Conservatives in California were themselves galvanized by this, as they saw it as an attempted Communist takeover of their state and used massive political propaganda portraying Sinclair as a Communist, even as he was being portrayed by American and Soviet Communists as a capitalist following the Que Viva Mexico! debacle. Robert A. Heinlein, the science fiction author, was deeply involved in Sinclair's campaign, a point which Heinlein tried to obscure from later biographies, as Heinlein tried to keep his personal politics separate from his public image as an author. Sinclair was defeated by Frank F. Merriam in the election, and largely abandoned EPIC and politics to return to writing. However, the race of 1934 would become known as the first race to use modern campaign techniques like motion pictures. Of his gubernatorial bids, Sinclair remarked in 1951: "The American People will take Socialism, but they won't take the label. I certainly proved it in the case of EPIC. Running on the Socialist ticket I got 60,000 votes, and running on the slogan to "End Poverty in California" I got 879,000. I think we simply have to recognize the fact that our enemies have succeeded in spreading the Big Lie. There is no use attacking it by a front attack, it is much better to out-flank them." An early success was the Civil War novel Manassas, written in 1903 and published a year later. Originally projected as the opening book of a trilogy, the success of The Jungle caused him to drop such plans, although he did revise Manassas decades later by "moderating some of the exuberance of the earlier version"; a description—in Sinclair's case—very much of a relative kind. The Jungle brought to light many major issues in America such as poverty and other social wrongs. He has been criticized for using racial epithets in his books, but Sinclair grew up in the nineteenth century, where epithets were used to refer to people of certain ethnic backgrounds. In his books, he used these to realistically portray the way in which foreigners and minorities were referred to and treated. For example, in his book Oil!, one character uses a disparaging word to refer to non-Jewish people and a different character uses a disparaging word to refer to Jewish people. Some argue that no offense is intended or implied and that the books were written to accurately reflect the way people thought during the time. However in other books, Sinclair goes well beyond the simple use of racial epithets in quotes. For example in The Jungle, it is the narrator who describes African Americans in a highly negative light. To some, this description is meant merely to capture the mindset of the Eastern European immigrants who are the book's protagonists (a group which was itself held in low regard in America at the time). To others, the descriptions reflected what was possibly Sinclair's own racist views. Although some might argue that at the time The Jungle was published, the epithets against blacks were unnoticed by both his supporters and detractors, likely these were his white supporters, as African American readers would have been offended by the epithets in a post-Plessy v. Ferguson, dawning-of-the-Jim-Crow-Era period. It is considered erroneous to assume that if the majority classes expressed no offense at Sinclair's views, they were not offensive to his black contemporaries who had no platform on which to express their umbrage with Sinclair's portrayals of them. Nevertheless, The Jungle's impact was far-reaching. Sinclair helped found the California chapter of the American Civil Liberties Union in the 1920s. Sinclair is well-known for his principle: "It is difficult to get a man to understand something when his salary depends on his not understanding it." This line has been quoted in many political books, essays, articles, and other forms of media, including Al Gore's 2006 film, An Inconvenient Truth. He was also firmly in favor of prohibition, most obviously in his novel The Wet Parade, which tells the story of a prohibition agent from a pro-Dry slant. Between 1940 and 1953 Sinclair wrote 11 novels about an American named Lanny Budd that, read in sequence, detailed much of the political history of the Western world in the first half of the twentieth century. Almost totally forgotten today, they were all bestsellers upon publication and were published in 21 countries. The third book in the series, Dragon's Teeth, won the Pulitzer Prize in 1943. Long out of print, the Lanny Budd series have recently been re-issued by Simon Publications. For technical reasons, each original volume is issued in two parts, forming a 22-volume set. In Sinclair Lewis' novel It Can't Happen Here, Upton Sinclair is depicted as an eccentric and a supporter of fascism from opportunistic motives, who is rewarded for his support of an American fascist government by being made ambassador to Great Britain. Sinclair is featured in Harry Turtledove's American Empire trilogy as the Socialist Party winner of the 1920 and 1924 United States presidential elections. Sinclair is featured as one of the main characters in Chris Bachelder's satirical fictional book U.S.! : a Novel. Sinclair is the frequently assassinated and resurrected personification of the contemporary failings of the American-left and portrayed as an ineffectual and out-of-touch reformer always trying to implement American Socialism. His 1937 novel, The Gnomobile, was the basis of a Walt Disney musical motion picture in 1967 titled The Gnome-Mobile. ↑ CBC.ca, Novelist's book about murder trial called into question. Retrieved June 11, 2007. ↑ Spartacus Educational, Upton Sinclair. Retrieved June 11, 2007. ↑ The Virtual Museum of the City of San Francisco, End Poverty in California, the EPIC movement. Retrieved June 11, 2007. All links retrieved January 12, 2016. Works by Upton Sinclair. Project Gutenberg. "The Fictitious Suppression of Upton Sinclair’s The Jungle" by Christopher Phelps in History News network. Upton Sinclair, "End Poverty in California The EPIC Movement", The Virtual Museum of the City of San Francisco. 1992 audio interview of Greg Mitchell, author of The Campaign of the Century: Upton Sinclair's Race for Governor of California and the Birth of Media Politics. Interview by Don Swaim of CBS Radio. RealAudio. This page was last modified on 12 January 2016, at 15:21.